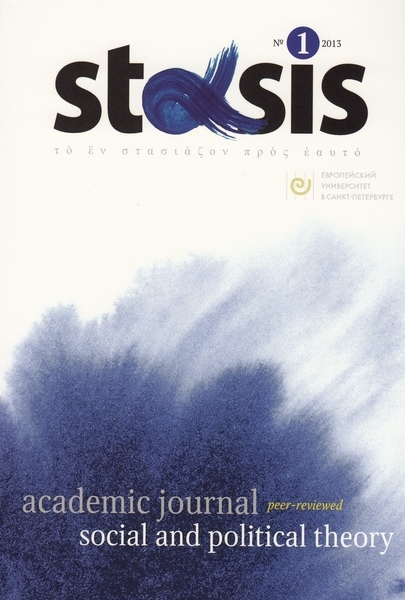 Stasis is a peer-reviewed academic journal in social and political theory, which is jointly edited by a group of intellectuals from Eastern, Central, and Northern Europe. The Journal is published by the European University at Saint-Petersburg. Stasis is a bilingual journal that publishes articles in English and in other languages from the region. Stasis accepts for publication articles both in English and in the languages of the region. In the case of acceptance, the articles originally written in other languages are translated into English. Unlike many academic journals, Stasis is conceived as a cooperative project where the international board is not a consultative body but a collective editor. The title, Stasis, means at once a particular position, an interrupting suspension, and an uprising. The journal thus represents an excentric and estranged standpoint which considers things and events while always holding in view the possibility of revolutionizing them. Far from defending a stagnation, Stasis thus suggests a sudden interruption of the hectic inertial motion, in a move of reflection and contestation.